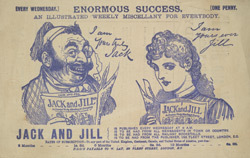 This is an advertisement for a comic entitled Jack and Jill. Comic periodicals contained jokes, verses, riddles, cartoons, caricatures and satire. They actually did a lot more than just making people laugh, they often made reference to current events and dealt with very serious political and social issues but combined these with trivial stories and pictures.